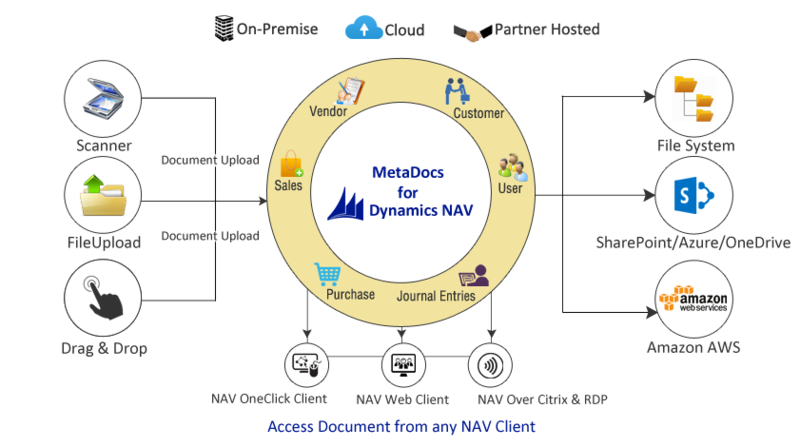 MetaDocs for NAV is the Document Management Add-on for Microsoft Dynamics NAV. A complete Document Management solution that allows you to scan documents straight into NAV or drag and drop electronic documents from multiple locations into NAV. Users can set up rules for storing different types of documents in specific locations in NAV, on a local file storage, cloud storage or on you SharePoint Intranet. Access your data outside your office using any Web Browser or go mobile with our Android and iOS apps. MetaDocs provides all the functionality for an effective management, rapid utilization and secure control of any kind of information. It makes no difference if you are using the Role Tailored Client, the Classic Client or a mix hereof. Document Management with MetaDocs will adapt to all scenarios. Receive multiple scanned documents at once. All Data backed up in a Highly Secure Data Center. All data will be backed up daily, for maximum redundancy and business continuity in case of a natural disaster.